The Stampin' Addicts had to move their retiring products hop to next Friday, May 8th. Sorry about that! I think the extra time will mean more fabulous projects to see, so be sure to check back then! 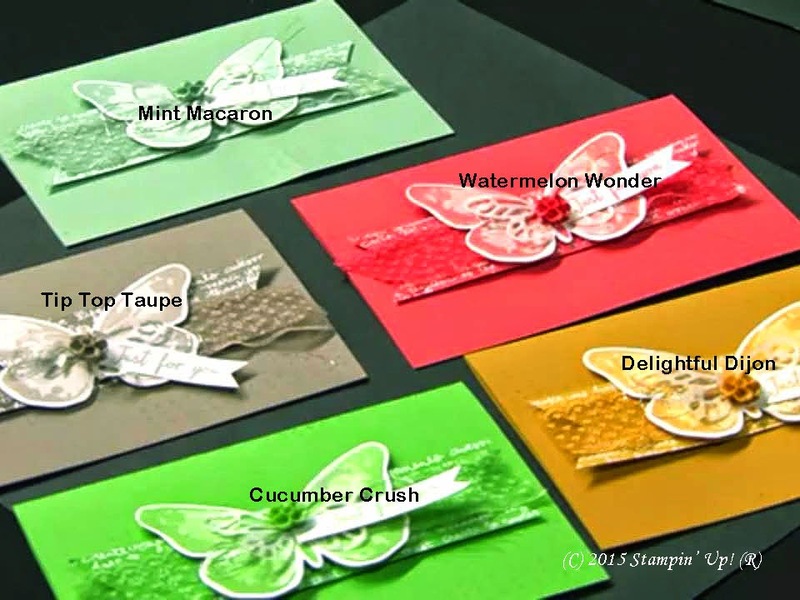 Meanwhile, to get you excited for the new annual Stampin' Up! catalog that starts June 2nd, I have the names of the new In Colors, and some samples to show you! These were revealed at the South Pacific Stampin' Up! Convention and if you look verrry closely, you'll see new stamps, dies and embellishments! WOOHOOO! Click on the picture for a closer look. Yes, there are new butterfly stamps, butterfly Framelits dies, In Color Sheer Lace Trim, and sweet little In Color Blossom Accents! And if you were really, really observant, you probably noticed the reformulated DSP background paper under the lace trim. I LOVE it, because I know I will use all four designs....no more chevrons! Wahoootie! Thanks for sharing the new colors. Love the Tip Top Taupe & Mint Macaron.